A team of Alzheimer's disease (AD) researchers has shown that a DNA vaccine directed at the toxic Abeta42 peptide protected the animals comprising a mouse (AD) model from both amyloid plaques and pathogenic tau tangles. Amyloid deposition and hyperphosphorylation of tau protein are both pathological characteristics of AD. Investigators at the University of Texas Southwestern Medical Center (Dallas, USA) had demonstrated previously that a vaccine based on Abeta42 peptide could reduce buildup of amyloid plaques and tau tangles, but with unacceptably severe side effects. 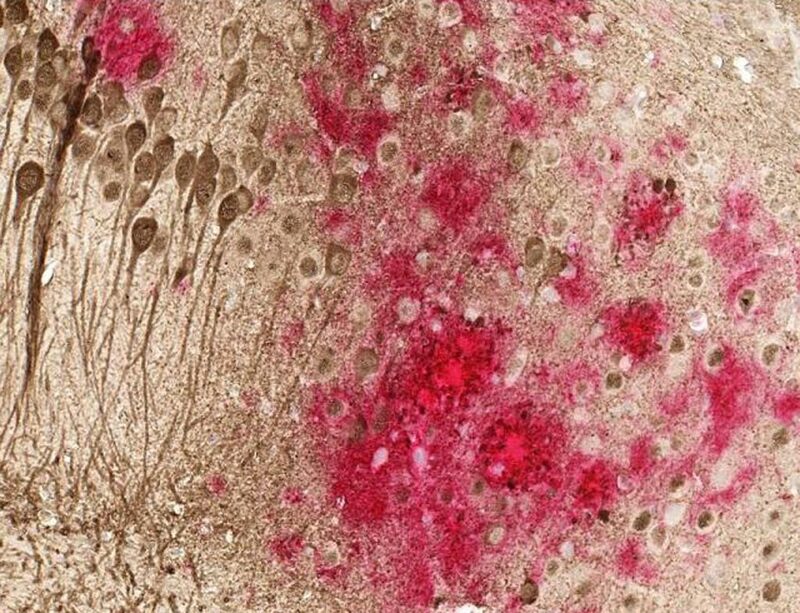 Image: Toxic amyloid plaques (red) and tau tangles (brown) form on the brain of a mouse modeled to have Alzheimer\'s disease. This study shows that a DNA vaccine reduces both amyloid and tau in the mouse AD model, with no adverse immune responses (Photo courtesy of the University of Texas Southwestern Medical Center). In the current study, the investigator used a triple-transgenic mouse model (3xTg-AD) that developed plaques and tangles in the brain similar to human AD. Four cohorts of between 15 and 24 mice each were injected in the skin with DNA coding for the Abeta42 peptide. 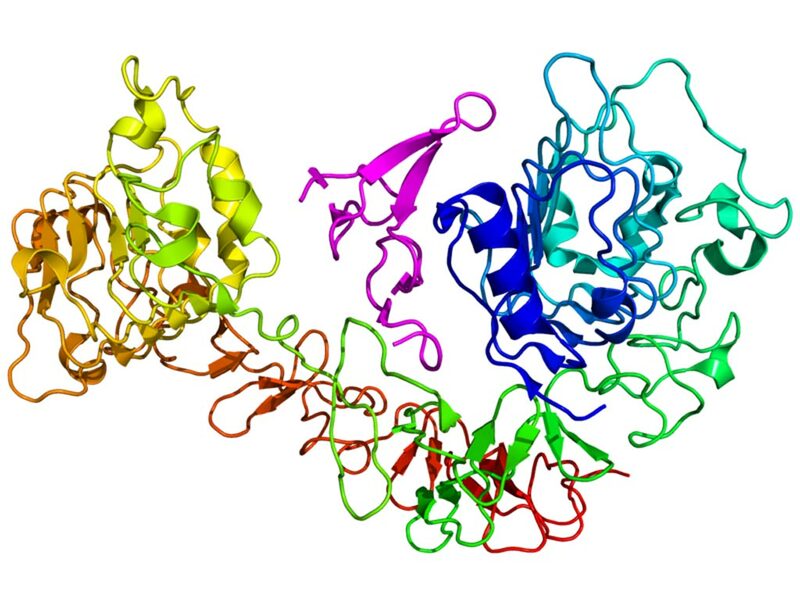 The researchers had shown previously that full-length DNA Abeta42 trimer immunization was non-inflammatory and induced a regulatory immune response. Results published in the November 20, 2018, online edition of the journal Alzheimer's Research and Therapy revealed that the vaccine caused a 40% reduction in beta-amyloid and up to a 50% reduction in tau compared with non-immunized 3xTg-AD control animals, with no adverse immune response. Genes encoded by the DNA in the vaccine were expressed within the skin, and the peptides were taken up by dendritic cells traveling to the regional lymph nodes and presenting the antigen to B- and T-cells. Immunotherapy with DNA Abeta42 trimer led to reduction of Abeta40/Abeta42 peptides and amyloid plaques, and as shown here for the first time, DNA Abeta42 trimer immunization led also to significant reduction of tau from the brains of the mice. "If the onset of the disease could be delayed by even five years, that would be enormous for the patients and their families," said senior author Dr. Doris Lambracht-Washington, assistant professor of neurology and neurotherapeutics at the University of Texas Southwestern Medical Center. "The number of dementia cases could drop by half."